production by Shigeru Miyamoto, direction by Eiji Aonuma, music by Koji Kondo, etc. etc. Almost five years ago I set out to beat The Legend of Zelda: Ocarina of Time. At that time, I had never attempted to complete, or even dig my teeth into, any Zelda game. I had basically just goofed around with my brother’s copy of The Legend of Zelda and my cousin’s A Link to the Past. What I didn’t realize going into Ocarina was the extremely heavy reliance the game places on familiarity with Zelda conventions. So, in truth, I never really got into it, and it took me forever to complete. In fact, a year and a half went by before I finally killed Ganon(dorf). That was way back in 2006 and since then I have become very well acquainted with the Zelda machine, having completed The Legend of Zelda, The Adventure of Link, A Link to the Past, Link’s Awakening, Oracle of Ages, Oracle of Seasons, Four Swords, The Minish Cap, and Phantom Hourglass. Now something of a Zelda vet, I felt prepared to take on Ocarina‘s direct sequel, Majora’s Mask. For those unaware, Zelda games often come in twos. The first game out of any given pair is usually a more typical Zelda experience and involves the evil Ganon as the primary villain. These games are usually followed by a direct sequel with a less restrictive, “anything goes” approach. Majora’s Mask fits neatly into the latter category. Unlike most Zelda installments, there are only four main dungeons. Getting access to the dungeons makes up the majority of the game. There are many boss battles and interesting events that have nothing to do with a dungeon. I would estimate that 2/3 of my time was spent in the overworld or in mini-dungeons, with only 1/3 spent in major dungeons. There are other “black sheep” elements that stand out, as well. Easily the biggest, and perhaps most annoying, is the three day cycle the game follows. The premise is that a moon is slowly but surely on course to collide with the earth, wiping out an entire town/region/whatever. However, it is totally impossible for Link to save the town in only these three days so he must use the Ocarina of Time to go back to the beginning of the three days, over and over and over. Fortunately, any major items that Link has collected travel back in time with him. Eventually, I came to accept and enjoy the three day cycle. Another feature that really sticks out is the mask system. Throughout the game, Link will collect many masks endowed with special powers. There are three fundamental masks that allow Link to transform into non-human sentient races that exist in the game world, accompanied by their special abilities and characteristics. There are also many other, non-essential masks that grant powers ranging from almost useless to extremely convenient. The cute and extremely gay Bunny Hood makes Link a speed demon. I found this mask to be indispensible. On the other hand, there’s a mask that lets Link hear the thoughts of animals. How nice. A player could spend many hours trying to collect every mask. In fact, side missions are extremely abundant and probably provide the bulk of playing time for those willing to pursue them. Majora’s Mask has received some criticism for being too short. I don’t think it’s actually all that short, but that the small number of dungeons gives the illusion that there isn’t a lot to the game. However, the side quests really do add up to a big chunk of game time. 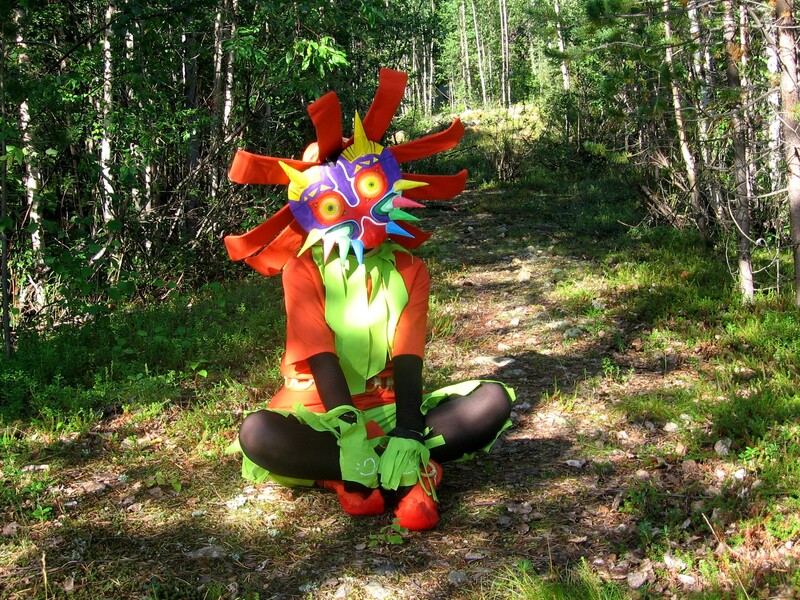 I enjoyed Majora’s Mask as kooky, often creepy, change of pace from the usual Zelda formula. The End. This entry was posted in a recommendation, a software recommendation and tagged majora's mask, zelda. Bookmark the permalink.